Science in the City ("SIC") is a week long intensive STEM summer camp for incoming 5th and 6th grade underrepresented (minority) students from throughout the Bay Area at Stanford University that takes place from July 16th to 20th through a partnership with Stanford's Graduate School of Education and The Social Engineering Project, Inc.
With all of the excitement and emphasis lately on the "T" in STEM (which is becoming synonymous with coding and software), the other letters - Science, Engineering and Mathematics often get left behind. Although learning how to code is important, students of color may set their sights on being great coders but not set their sights on going to college, majoring in a STEM related major at a top school, and receiving a degree where they can be recruited to work at a tech company. This is why the purpose of Science in the City is to transform its students into scientists that develop a deep, passionate love for science (engineering, chemistry, and physics). Science in the City is made possible through a collaboration between Stanford University's Science in the City Research Group through the Graduate School of Education and The Social Engineering Project, Inc. and receives funding from various tech companies in Silicon Valley, such Northrop Grumman, PG&E, and Airbnb. 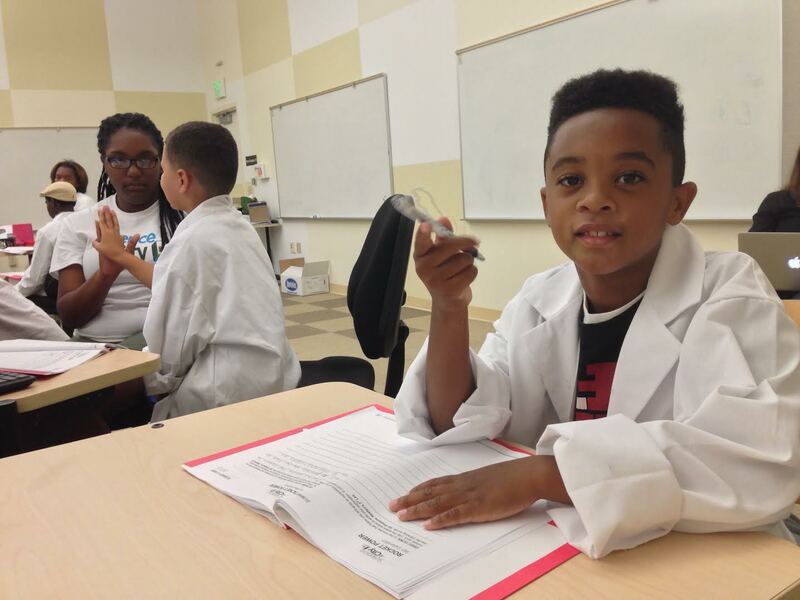 SIC realizes that the lack of enrichment programs during the summer time disproportionately affects students of color, so its objective is to provide low cost academically rigorous science programs for these students. “Our only goals are to make sure that these students have fun and fall in love with science at the same time,” says Bryan A. Brown, co-founder and curriculum director of Science in the City Summer Camp and Associate Professor of Science Education at Stanford University. "We will incorporate more virtual reality in our curriculum to demonstrate how students can look at science from different lens," says Dr. Brown. "These students will learn about real life problems in their communities, such as the effects of lead contamination in their water, like in Flint, Michigan and Oakland, have on the human body and what steps that they can take as 11-12 year olds to protect themselves, their families, and their communities,” says Kevin L. Nichols, co-founder, President and Executive Director of The Social Engineering Project, Inc.
Students will also learn about electrical currents and circuits by building fan powered cars, the science behind humans being lactose intolerant, how to build a marshmallow launcher, and how to build cars propelled by rubber bands. The staff consists of college students and recent graduates of various colleges throughout the Bay Area. Organic healthy meals will be provided at the camp as well. Students will participate in labs and then have to explain the concepts that were presented and what they learned from them. A minibus will take 25 students from the East Bay to and from Stanford each day from Oakland. For more information about Science in the City and our other programs, please visit http://www.TheSocialEngineer.org. 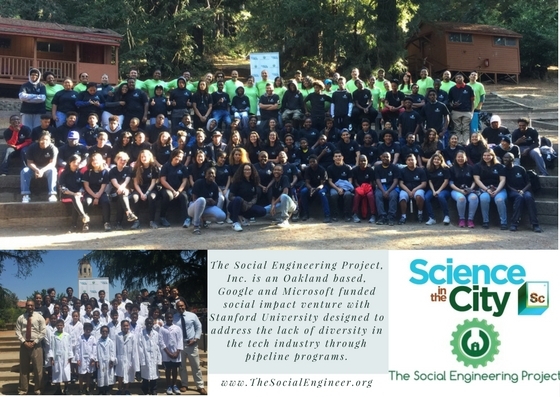 The Social Engineering Project, Inc. (http://www.TheSocialEngineer.org) is an Oakland-based Google and Microsoft funded social impact venture with Stanford University that is designed to address the lack of diversity in the tech industry through STEM related pipeline programs. Presently, it is a Benefit Corporation but is in the process of converting to its own tax exempt organization. The Science in the City research team (scienceinthecity.stanford.edu) at Stanford University is comprised of former science teachers who examine how to improve science teaching and learning in urban contexts. The Science in the City website provides a venue for students, teachers, and colleagues to exchange ideas and to hear about new research findings. Kevin L. Nichols is the co-founder of The Social Engineering Project, Inc. He has worked in multifaceted capacities in some of the most prolific international law firms in the country, such as Morrison & Foerster, Paul Hastings, Heller Ehrman, and Holland & Knight. His interest in diversity and technology began while he was a mechanical engineering/diversity intern at the Lawrence Livermore National Laboratory. Later, he became the Executive Director of the California Diversity Council and the African American Wellness Project. Kevin has become a social networking expert and full-time consultant specializing in litigation technology (eDiscovery), diversity, and social media marketing for the legal industry. Nichols has been featured on LinkedIn’s Hall of Fame, Yahoo’s Blog, in the Examiner, CNN Money, Reuters, MarketWatch and the Wall Street Journal. Millions saw Kevin while logging in to LinkedIn.com from 2012-2014. Kevin attended the University of California, Berkeley and recently completed an Executive Program for Social Entrepreneurship at Stanford's Graduate School of Business. For a full biography and CV, please visit http://bit.ly/KLNport. Bryan A. Brown is an associate professor of science education at Stanford University, a member of Stanford’s Science in the City research team, and a co-founder of The Social Engineering Project. His work in the center for research on teaching at Stanford focuses on improving urban science education. He focuses on exploring how language and identity impact urban students’ learning. Dr. Brown is a former high school science teacher who earned a Bachelor’s degree in Biological Sciences from Hampton University, a Master’s degree in Educational Psychology from the University of California, and a Ph.D. in Educational Psychology from the University of California, Santa Barbara. He was the 2007 winner of the National Association for Research in Science Education’s (N.A.R.S.T.) award for outstanding early career scholarship. Dr. Brown is the founder and executive director of Etu Schule, a non-profit organization that supports the educational development of minorities throughout the state of California. Please find a video of news coverage from last year's camp http://bit.ly/SICktvu2 and the previous year's camp http://bit.ly/scincity2016.